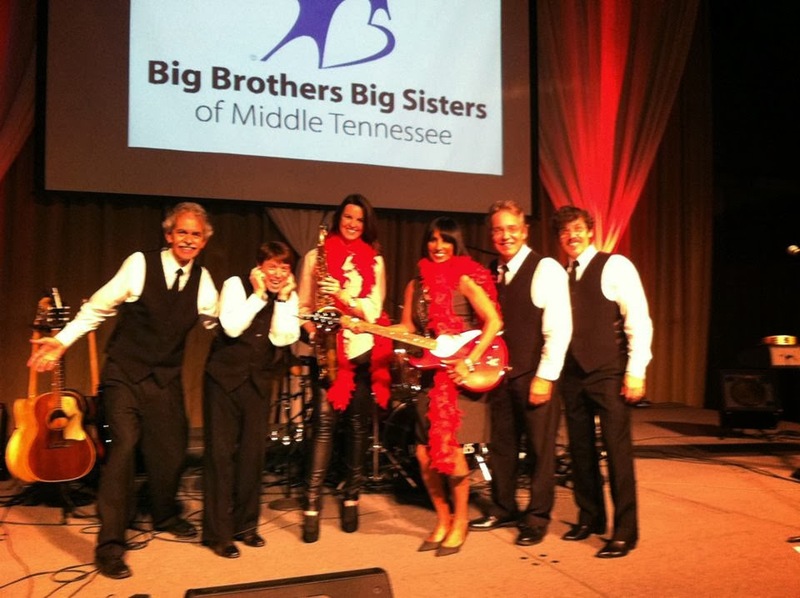 On October 11, at The Factory in Franklin, we played the annual Franklin Wine Festival, to benefit Big Brothers Big Sisters of Middle Tennessee. It's their major fundraiser of the year, presented by Cool Springs Wines & Spirits and sponsored by Nissan. 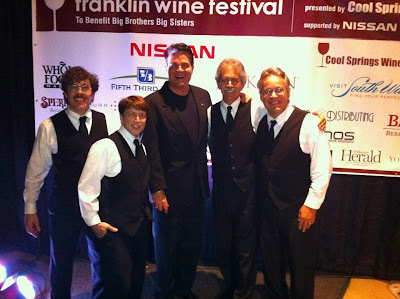 We had been invited to perform at the Franklin Wine Fest back in June by Todd Wilson, a new member of the Big Brothers Big Sisters events and development staff. Soon after that, we approached him about using our song "If We Simply Love" as a theme song. Todd presented the idea to his leadership team and soon discovered there was complete consensus to adopt "If We Simply Love" as the official song of the agency. We spent several weeks working on a new version of the song, rewriting some of the lyrics to make the song more specifically about the mission of BBBSMT. WannaBeatle David was the main force behind the original song, and he was on board for finding new lyrics that would work in the new context. As one example, he was inspired to change the line "give peace a chance" to "give kids a chance." 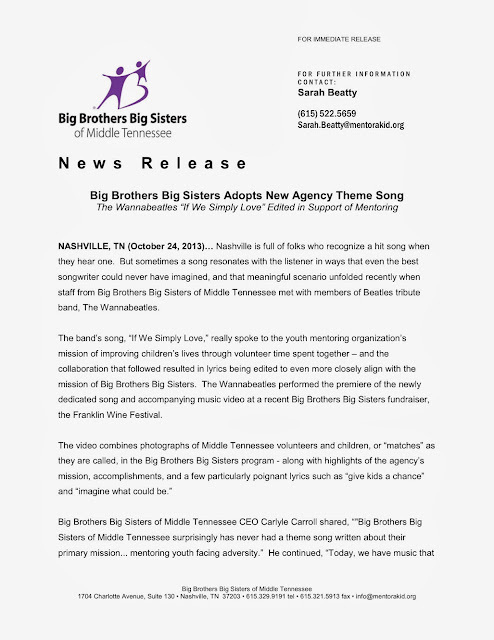 We also thought of translating the song into Spanish, in order to reach the Hispanic community that BBBSMT also serves. That version of the song has been written, as described in previous blogs, and a new vocal has been recorded, but it hasn't been mixed or released yet. More on that later. In addition, Todd made a DVD of the video, and duplicated a hundred copies of it, to give away in a "swag bag" to special sponsors and volunteers before the event. David was quoted on the back cover, and spoke eloquently for our involvement and what it means. 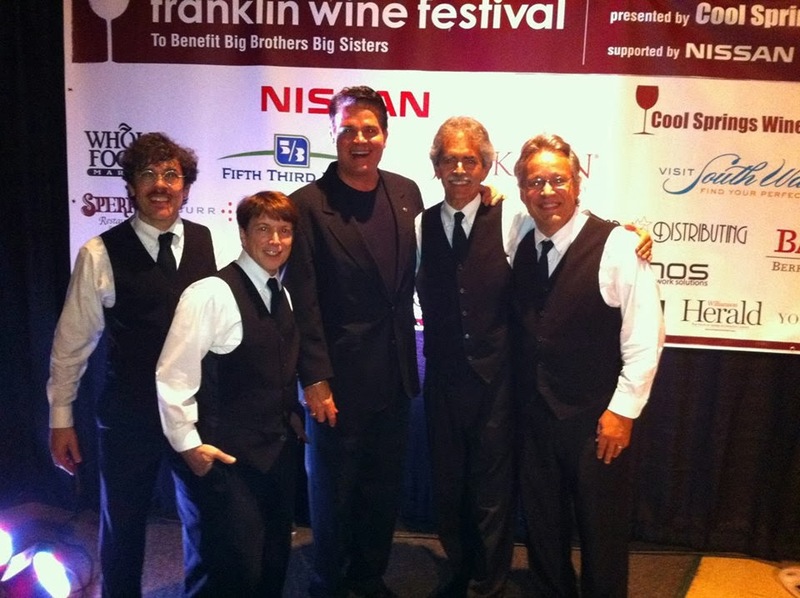 Part of our performance at the Franklin Wine Festival was to include playing our new version of "If We Simply Love" along with the video. We were scheduled to play two sets, and we decided to put the new song into both sets. It was an amazing event. There were several bands on three different stages. We were the only band on the large stage in Jamison Hall, and an excellent sound company had prepared it for us, along with a large video screen behind the stage. As we were setting up, we saw other friends of ours from other bands - jazz duo Frank and Diane Marino, along with Cole Burgess playing sax with them and drummer Chris Browne. We saw our young friend Dylan Jones there, who was playing keyboards with Storm Kings. 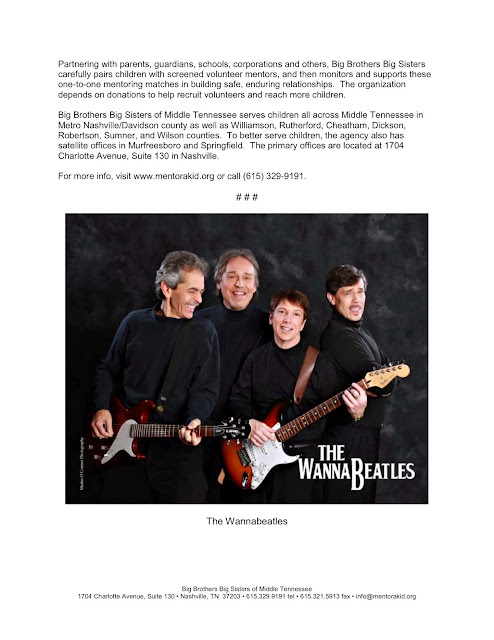 We saw Gary Pailer, who has the interesting distinction of having auditioned for The WannaBeatles - right before we discovered Nathan was the guy for us. Part of attending the event was being able to walk around the Factory and taste free samples of wines and specialty foods from a variety of restaurants. One particular offering I enjoyed was a mix of various fresh vegetables - chopped tomatoes, cucumbers, onions, etc. with a crunchy ingredient, which turned out to be ground potato chips - served on a polished wooden slat. I'd never eaten off a wooden slat before, so I admired the creativity on display there, by a restaurant called 1808 Grille. 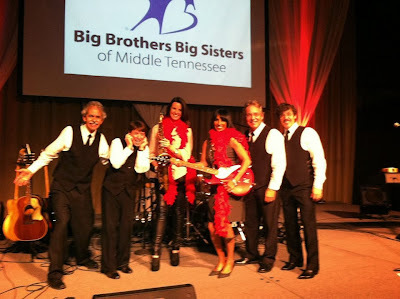 Our shows went over fine, and our new theme song went along well with the video, and many items were auctioned off to help raise money for the kids. Here's a shot from the stage with us and two of the ladies who helped with the auction - Deja Knight and Vicki Yates, both of whom work for NewsChannel 5. Todd told us later that 1700 people had attended, and the organization had raised $170,000. We were thrilled to be part of such a big event. Thanks to Todd and Sarah at BBBSMT for making it happen. The title of this blog means "back to school" in Spanish. That's because a recent blog pertaining to our translation of a song into Spanish yielded some feedback from Spanish speaking readers that was very educational. We're learning more about differences between languages. To start with, there are at least four ways to say "back to school" in Spanish. "Back" can be "vuelta," "retorno," "regresso" or "volviendo." With two of those, we can see the similarity to English words "return" and "regress." "Back" is one of those simple monosyllabic Anglo-Saxon words that can mean many things, which is part of what gives the English language its power. Finding the equivalent expression in Spanish involves a discussion about nuances of meaning. The previous blog on our Spanish translation mentioned that WannaBeatle David's dad, Reinaldo, is a professional translator. During the time David and I worked on "Si Puedes Amar," it became apparent that Senor Toledo enjoys the role of a teacher. David called him several times during the session to check on certain phrases. When I spoke with him on the phone, he started quoting from the instruction manual he had written on proper pronunciation of Spanish. He made it very clear that Spanish vowels are very consistent: A is always pronounced "ah," E is always pronounced "ay," etc. This information impressed me that Spanish is more logical than English, at least in that department. On the other hand, Spanish has all those accents, which of course are completely missing from English. When I typed a version of "Si Puedes Amar," I had ignored the accents, (mostly due to lack of keyboard options,) but that was a big mistake. Sí, meaning 'yes' must be always accented on the i. Thus it becomes an adverb of affirmation. But si, meaning 'if' is written without the accent mark and it is a conjunction. So, they are two different animals, not the same. Also, ‘más’ is an adverb of quantity, meaning ‘more.’ But ‘mas’ is a conjuction, meaning ‘but.’ So, there you have it. THE ACCENT MARK IS A MUST IN SPANISH, NOT AN OPTION. Many, many Spanish speakers make the mistake of leaving it out. For instance: 'mi' is a possessive pronoun: but 'mí' is a pronominal which generally follows a preposition. Thus, we say 'mi corazón' (my heart), 'mi casa,' (my house), but 'para mí,' 'en mí,' ‘de mí,’ and so on. Here are his comments on the verb we changed in the bridge, which led to a new rhyme scheme. As to 'están' or 'estén,' the proper language should be 'estén', for it is in the subjunctive mood, which in Spanish indicates doubt or uncertainty. But 'están' is not incorrect in popular language. O el nuevo día temer enfrentar. Verás al mundo que vas a crear. ¿Cómo será para ti, y para mí? Pero a este fin quiero ayudar de corazón. Si tan cerca estamos de lo que hemos de ser? ¡La vía es el amor! Once again, gracias to David and his dad for giving us a quality translation. Our apologies for the typographical errors that created problems in the Spanish version. We will be happy to report on the progress of "Si Puedes Amar" and all other efforts to reach out to audiences beyond those who understand English.